Maharashtra is one of the few states in India which boast of their hill forts. You can find each and every district of this beautiful state blessed with such forts. Even though they have become trekking destinations over a period of time, they are still visited on account of their historical importance. One such fort nestled atop lush green hills is Harihar Fort. 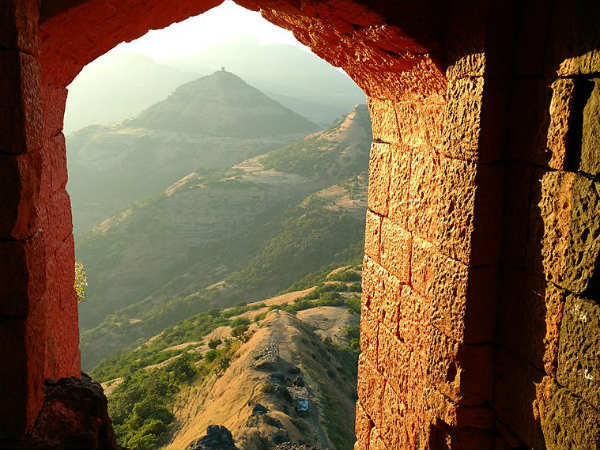 How about trekking up this beautiful hill of Maharashtra and reaching its ancient fort? If you are an ardent trekker or love exploring the history of a place, then you should not miss out on visiting Harihar Fort. Being a hill fort, it is a year-round destination and is frequented by tourists, especially trekkers, from all over the state throughout the year. However, the best time to visit is when the climate is favourable and the temperature conditions are optimum, i.e., from October until the end of February. You can also visit it during the monsoon season, but you need to be very careful while trekking up the hill as the way becomes too slippery. Harihar Fort is located in the Nashik district of Maharashtra at a distance of about 40 km from the main city. Located atop a hill with an elevation of more than 3500 feet, it overlooks the nearby settlement of villages like Harshewadi. The history of the fort stretches back to the period of the Yadava dynasty in between the 9th and 14th centuries. The fort was constructed to guard the trade route. Later on, it was captured by several other invaders and local rulers until it came under the control of the British army. Today, the fort is in ruins and is only used as a trekking site. You need to climb up a flight of rock-cut steps to reach the fort. The villages from where the trek starts are Harshewadi and Nirgudpada. If you would love a perfect mix of history, nature and adventure, then you must head towards Harihar Fort in Nashik. On one hand, you get to savour the history of Yadava dynasty and other rulers of Maharashtra through the ruins of the fort and on the other hand, you can relish the beauty of nature as you trek up the hill. Unlike other normal treks, this trek is filled with thrill and excitement. So, why not get yourself to this wondrous beauty? By Air: The nearest airport to Harihar Fort is located in Mumbai at a distance of about 165 km. From the airport, you can get a direct cab to Harihar Fort. You can also catch a bus from Mumbai to Nashik and then from there, a cab to Harihar Fort. The distance between Nashik and Harihar Fort is 40 km. By Rail: Nashik is the nearest railhead from Harihar Fort. You can take a direct train to Nashik Junction and then from there, a cab to the base of Harihar Fort. By Road: As Harihar Fort is located atop a hill, it cannot be accessed by road. You can reach its base by hiring a taxi or catching a bus and then from there, you need to trek up the hill by taking rock-cut steps to reach the summit of the fort.